Basketball shot selection is an individual players’ decision that is defined by the individual, coach or team. For an individual player shot selection is their ability to recognize what is going on in a possession, know the shot options available and choose the best possible shot from all the information they have gathered. My players have to make countless decisions in a game. Unfortunately, a coach doesn’t have the advantage of time in the middle of a possession to help a player decide exactly which shot will be the best for the moment. I need to train players to think instinctively in order for their shot selection to be advantageous to them and the team. In the moment I influence very few of those decisions. I can’t, nor would I want to, tell my players what to do in each situation. What I can, and do do, is help my players develop their independence in each of those decision-making situations. A key to shot selection is a player being able to carry out a particular tactic with minimum amount of thought and quick decision-making. Shot selection needs to become an automatic response based on the player’s recognition and reaction to cues from the court position, the opponent’s position and the characteristics of the incoming pass. As a player’s skill level increases, so do the available shot selection choices, so there is not usually one specific shot that is right for a situation. There are individual differences as well. What may be proper shot selection for one player may not be the right shot for another player if given the exact same situation. For a coach there is a art to limiting the shots a player is allowed to shoot and limiting their ability to develop their game and confidence. How would your players define this shot? Yes a shot that is open, in range, and in rhythm defines shot selection for our players, but our view of shot selection goes deeper than a mantra. Beyond time and score situations, like the end of a quarter, half or game, my players have the freedom to shoot any shot at any time. My rationale, and experiences, have led me to understand that it is really difficult to get open shots. It is also valuable to get those open shots. So regardless of where, or when, that open shot becomes open we want a player to shoot it. Why? Because it is unlikely we will get a better shot in a possession than an open shot. This is also part of my zero seconds philosophy. We believe that the most open an offensive player is going to get is when they first catch the ball. As such there are no pre-determined movements. We want technical aspects of offensive play executed quickly and decisively with no pause on the catch. This means that as soon as a player’s feet hit the ground they are immediately into their shot, pass, or drive. As a result we do not emphasize jabs or fakes but rather we want our players to make decisive decisions on the catch about whether to shoot, dribble or pass. We also believe the goal of the offensive player who catches the ball is to score. Because of this they need to attack immediately on the catch with no hesitation to take advantage of a recovering defender or helpside defenders. If they cannot score it is because the defense prevented it. This creates secondary decisions. The decision making progression on the catch is that we want all players to catch the ball prepared to shoot. Too many players catch the ball unprepared to shoot. We want to build a confident mindset. We also want to force a reaction from the defense on every catch. One of the ways to do this is to ensure that all players catch the basketball with the intent to shoot. My zero seconds philosophy does not diminish the importance of shooting the right shot at the right time. Since any player can shoot any shot at any time we also need to train a player to shoot the right shot at the right time. In my philosophy, it is not what I tell my players about shot selection, but what they tell me. I do not define shot selection for my players. Not one time last season did I criticize a shot. If I define a player’s shot selection than I feel like I am limiting a player’s ability to play confident and free. How then do I get players to understand what is, and what is not, an ideal shot for themselves and their team? I ask their teammates. If a player takes a shot I ask their teammates if it was a good shot or not. Was that shot a good shot? I also ask the player who shot the ball what their thought process was. Why was that shot get taken? Most of these efforts to develop my players shot selection decision-making process happen in practice, and through video analysis. As a coach my goal is to give my players a framework to operate within based on an understanding of percentage basketball. I create a system of play that is in the best interest of our team. The players are then responsible for holding each other accountable to the system of play, and to the best percentage shots that become available within that system of play. Through our games approach to coaching basketball and the use of questions we can help create the player who shoots the right shot at the right time (Learn more about a Games Approach to Coaching Basketball). I train my players to make better decisions during practice so that they are free in the games. It is important to give your players a chance to improve their shot selection away from the pressure of competition. It is also important to know that this is not a perfect process. My players still take what I would deem to be bad shots in games. Instead of being accountable to my opinion of what a bad shot it was, however they are now accountable to their teammates opinion that has been shaped in practice. Accountability means being held answerable for accomplishing a goal. The goal in this case is to take good shots for our team to be successful. By using questions to probe players for what is the best shots for accomplishing our goal, we are increasing awareness around clear expectations. A team works better when players are willing to help each other out, and players are more likely to help each other out when they’re knowledgeable enough to do so. 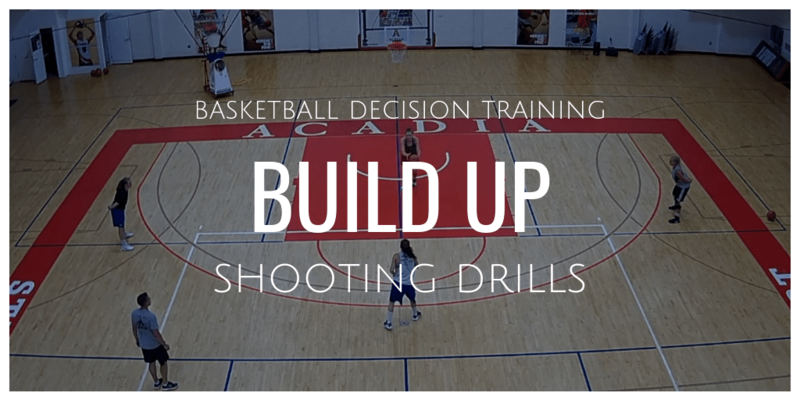 Asking questions helps educate players about shot selection. Most importantly, one of the guiding principles of leadership I stand by is to “make it seem like their idea.” Even though I could dictate what shot selection is, the goal becomes more trusted and supported when it at least seems like it comes from the players. The challenge is to get players to be willing to keep each other accountable for shot selection without it becoming divisive or negative. Players should know that criticism of shot selection is beneficial to player and team development. Try to always connect the reason why shot selection is being critiqued. Criticism does not mean negative. When I ask players about shot selection, I don’t just ask when it is a bad shot. To provide a frame of reference for what is a good, and bad shot, I ask questions when both types of shots are taken. We also don’t ask questions about every shot. That would negatively impact the flow of practice. The use of questions to create team accountability has helped us build the good to great pass mentality. I am not sure who coined the phrase originally, but I heard it from Gregg Popovich in the context of the extra pass a player makes. Good to great means, even though a player may have a shot opportunity, the next pass leads to a great shot opportunity. Great post, Chris. Shot selection is crucial and the decision is made in split seconds during a game. So, like you’ve mentioned, healthy criticism needs to be encouraged for development of the player and the team. According to studies, more than 60% of shots that are taken within 5 feet are successful. So, long range shots are not just riskier, but make it tougher for the team to get back on defense.